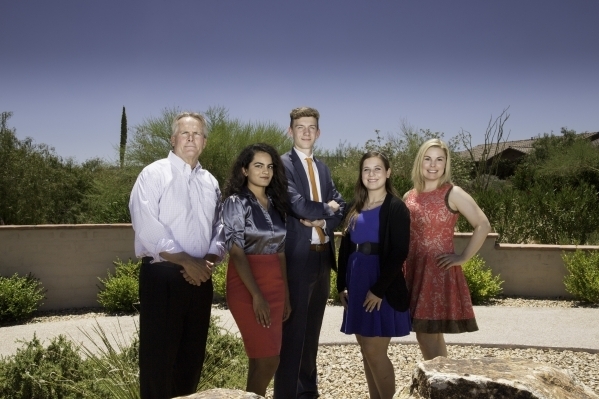 The Summerlin Children’s Forum, a nonprofit organization established in 1997 by community leaders and The Howard Hughes Corp., recently awarded three $4,000 college scholarships to outstanding students who are residents of Summerlin. The Summerlin Children’s Forum, a nonprofit organization established in 1997 by community leaders and The Howard Hughes Corp., recently awarded three $4,000 college scholarships to outstanding students who are residents of Summerlin. The 2015 high school graduates, Abi Prabhu, Parker Johnson and Roxanne Jones, share the exceptional combination of scholastic achievement, community service and talent in sports, music and dance. Abi Prabhu graduated at the top of her class from Palo Verde High School where she served as a Corps Commander in the school’s Air Force JROTC. An accomplished Indian classical dancer, she is studying at the University of Nevada, Reno to fulfil her lifelong dream of becoming a doctor. Parker Johnson, was named valedictorian of his class at Advanced Technologies Academy, where he helped create a nonprofit organization to teach basic emergency response techniques such as CPR. An Eagle Scout, he is now attending Brigham Young University. Roxanne Jones, who also graduated at the top of her class at Palo Verde High School, spent countless hours working with young people living with physical disabilities. A dedicated flutist, she is enrolled in the Honors College at Arizona State University with plans to become a physical therapist. Collectively, the list of achievements of these students includes more than 1,000 hours of community service for such organizations as Summerlin Hospital Medical Center and Clark County School District’s Adaptive Physical Education Department. All three are members of the National Honors Society at their respective high schools. Since 1997, the Summerlin Children’s Forum has funded scholarships, enrichment grants and special educational programs totaling more than $590,000. The annual scholarship program is open to all graduating high school seniors who reside in Summerlin.